Combines an antihistamine and a decongestant to effectively relieve itching, excessive tearing and redness of the eye caused by allergies (pollen, trees, grass, ragweed, dust, pets and mold). Allergies to ragweed, grass, pollen, dust, animal dander and mold. Antihistamine (Pheniramine Maleate) effectively relieves itching and excessive tearing caused by pollen, grass, ragweed, dust, animal dander and mold allergies. Decongestant relieves redness. Provides fast relief for itchy, watery eyes while reducing redness. Contains an antihistamine (to reduce inflammation and itching) with a decongestant to relieve redness, and reduce the swelling of blood vessels. Adults & children 6 years and over: Place 1 or 2 drops in the affected eye(s) up to four times a day. CAUTION: Do not use if you have glaucoma or a serious eye disease. If you are pregnant or breastfeeding, or have heart disease, high blood pressure or trouble urinating, talk to your doctor before use. Remove contact lenses before using. If you experience eye pain, changes in vision, or continued redness or irritation of the eye that worsens or persists for more than 72 hours, discontinue use and consult a doctor. Overuse of this product may produce increased redness of the eye. Do not use if solution changes colour or becomes cloudy.To avoid contamination of this product, replace cap after use and do not touch dropper tip to any surface. Store between 15°C and 30°C. Keep out of reach of children. If swallowed, contact a Poison Control Centre or doctor right away. 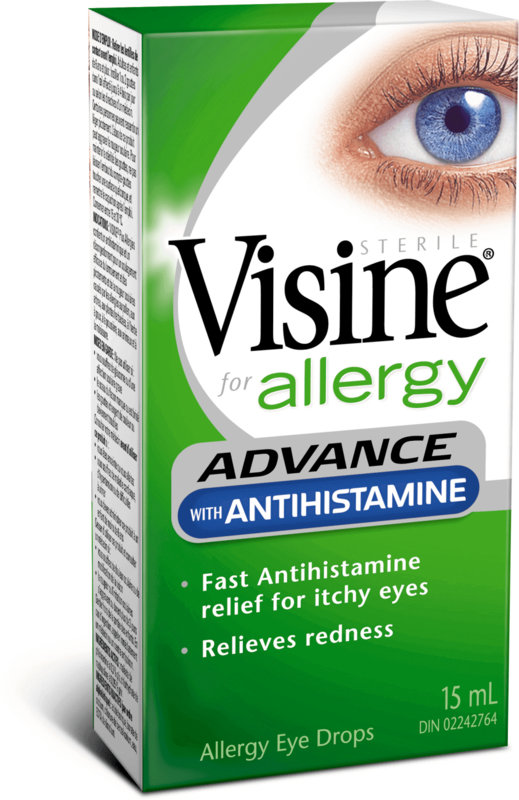 I have tried the other Visine allergy and two other brands. Absolutely nothing has come close to these drops! The relief lasts all day! Itchy eyes have been my worst symptom and the Advanced knocks that right down. Highly recommend these! My only concern is where I normally found these at Shopper's Drug Mart, they seem to be coming harder to find. I hope to find someone else that sells them! I have had severe allergies from grass pollen all my life. I would love to know the exact composition of the antihistamine used in these drops because it is the only relief I have ever found after over 40 years of searching. I have a very sensitive allergy to dust and even a little dust make my eyes bloodshot with no white spots at all and they become very itchy after I put these in the redness completely goes away in 10-20 minutes but only lasts 1-3 hours. We appreciate the time you have taken to write to us. Your experience with our product interest us and we would like to obtain additional information from you. Please call our Consumer Care Centre toll-free at 1-800-661-4659. We are open M-F from 8:00 a.m- 8:00 p.m.